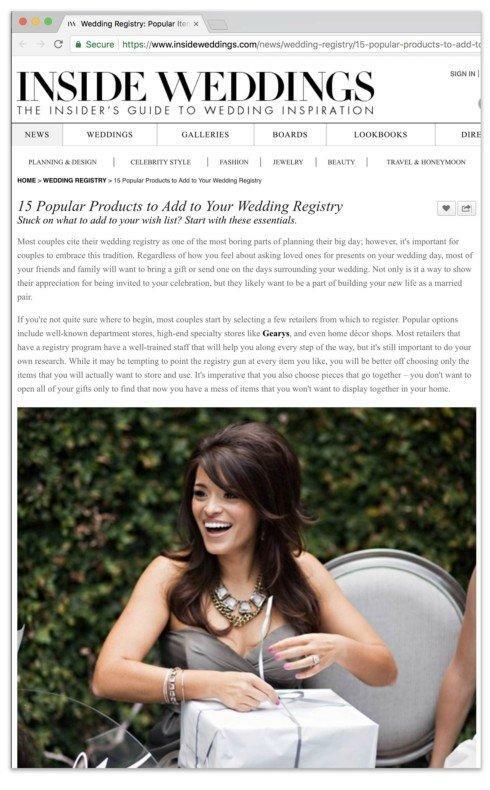 We're happy to see Smart Brands Anna Weatherly and Waterford make the 'must have' list on Inside Weddings. In the article, item #7 is Anna Weatherly's Simply Anna dinnerware. Stuck on what to add to your wish list? Start with these essentials. If you're not quite sure where to begin, most couples start by selecting a few retailers from which to register. Popular options include well-known department stores, the local independent retailer and even home décor shops. Most retailers that have a registry program have a well-trained staff that will help you along every step of the way, but it's still important to do your own research. While it may be tempting to point the registry gun at every item you like, you will be better off choosing only the items that you will actually want to store and use. It's imperative that you also choose pieces that go together – you don't want to open all of your gifts only to find that now you have a mess of items that you won't want to display together in your home.